Barn Dances or Scottish Ceilidhs - the band covers the lot! High energy celtic mix innovators with an inimitable style of pan European tunes (translation = 'we know loads of tunes from loads of places') including Irish, Scottish, English, French, Italian and East European.This really is a lucky break for anyone living between Reading and Calais (or even a bit beyond) - first class entertainment value at any function. 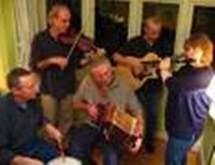 The band has built its reputation on communal ceilidh events around the UK with its jigs, reels, polkas and waltzes. The band's origins lie in the Oxleas Woods River Crossing Campaign of 1994 when they contributed their first Euro-Celtic performance to a mass of eco supporters. The band came together from member of folk-rockers "Traitors Gait", the South London ceilidh collective "Nellie" and others from blues and indie backgrounds. Glastonbury (so! they're willing to travel a bit). Yep! this ceilidh band gained just a little bit of notoriety when they appeared at the mud bath of the 1997 Glastonbury Festival!! They were the first band on as the weather brightened and were well received with their self penned "Stop The Rain Jig". Over the years, aside from The Glastonbury Festival, they have made frequent appearances at The Royal Festival Hall foyer and also played at The Guildford Festival, in the company of Richard Thompson, The McGarrigles, Jethro Tull and The Levellers. They have had fun-packed gigs at the gigantic Brighton Dome, Blackheath Halls and Cite de la Musique in Paris (an Irish festival where other artists included Lunasa, Sharon Shannon, Altan and the Kane Sisters). They have also featured on Radio London. This is another band with their own 'in-house' caller who becomes the 4th musician since she also plays the flute!